Brad on OPRAH, Friday May 19th!!!!!!!! WOW! What an experience! Be sure to watch OPRAH on Friday, May 19th. View Brad on Oprah Here! Oprah did a show on “Beating the Odds!” She included me as one of her guests for the show. I was on with a 2 legged dog, an amputee, and a boy who was stabbed. Oprah and I sat on stage and had a one on one interview and then at the end of the show she plugged my book. The entire Oprah experience took 8 days……this is how it happened! Wednesday, May10th, I received a phone call from an Oprah producer. They told me that they were thinking of using my story on an upcoming show. I spoke to a few producers that night and was asked if they did the show the next Thursday if I would be able to come up to Chicago. I told them yes! Then the next day on my way home from school, I received the phone call telling me that I had been selected to be on the show. And the fun began. We needed to plan for the Oprah crew to come to my school on Monday. Parent permission forms will given to my student’s parents. Over the weekend, I spoke to the producers several times as we need to discuss my story, their visit to Atlanta, travel reservations, and gathering pictures for the show. Then Monday arrived and the Oprah crew got to my school at 7am. They got me and my class on video for about an hour. Then they interview my assistant principal and some other people in the school. They shot my students without me around for a special message. Then they interviewed me for 1 hour and 45 minutes. There was a buzz going on at my school all day and everyone was excited. Parents, teachers and the students enjoyed the process. The Oprah crew really enjoyed their visit to Tritt Elementary. After they left, for the next few days, many phone calls back and forth occurred. They were very persistent to get the story right. They wanted me to send them lots of pictures. Travel plans were taken care of and I made sure to request enough tickets for Nancy, my mom, dad, brother and stepmother. All were all able to enjoy the experience. The ticket request was granted. Wednesday night quickly arrived and Nancy, Hilarie, and I flew to Chicago from Atlanta and was greeted by a limo to drive us from the airport to the Omni hotel. When we arrived to our suites, we were also given dinner vouchers. Everything in the hotel was great. We for sure got first class treatment! Once in Chicago we caught up with my family and met up with some friends. Then Thursday morning arrived. It was the day of the taping. We woke up at 5:30am and was picked up by the limo at 6:45am We arrived at Harpo Studios at 7:00am and we were greeted by producers and went to the green room. We had to leave all our cameras and cell phones behind. The halls were filled with Oprah pictures of her and her guests. Food awaited us but of course I was not hungry. While in the green room we went over the show in detail, and they started the make-up. This was by far the worse part of the experience. I hated the fact that I needed to wear make-up…….but I did it for Oprah! I was in the greenroom with Nancy, Hilarie, my assistant principal and my mom. My dad, stepmom and my brother,Jeff, all went to sit in the audience. Nancy, my mom, and Hilarie sat in the front row as they were told they might need to answer some questions. And then it was time to start the show……..I was left in the greenroom with Warren, an amputee. When it was time for my story, they walked me out to the stage. A video was playing as I approached. Then Oprah called me out and the audience went crazy. It was a great feeling to walk out on the set of the Oprah show to share my story! 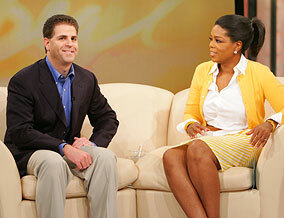 I sat down with Oprah on the stage and did a one on one interview for 2 segments of the show. Was I nervous???? Yes, I was a little nervous, but I got comfortable soon after I sat. The big surprise for me was when I saw my students on the TV screen talking about me. It was touching! And before I knew it, it was over! But then I was asked to come back out at the end of the show as Oprah plugged all of the guests books. And there it was…..the cover of my book, Front of the Class. What a great feeling! 1) You won’t get rich. 2) Don’t plan on being on Oprah….it just doesn’t happen! Well, so far I took care of the Oprah part, now I need to move on to the next step. After the show Oprah we went back stage and took some pictures with Oprah. The professional photographer said it might be a few months before we get them…….so I’ll wait patiently! Overall, everything was great! I’m excited to share this experience with the world! Pictures will be added soon!! !